The Shagya Arab breed has developed a lot during the last two centuries. It is a special Arab breed aiming for a good bone substance, perfect riding attributes and a sufficient size. The real Shagya Arab breed was first mentioned in 1789, when the austrian-hungarian national stud farm Babolna was founded. There, the venerable history of Shagya Arabs began. The term Shagya Arab for this breed exists since 1978, before that these horses were just mentioned as an Arab breed. Since the foundation of Babolna, the stud book was written with care. The stud farm was the home of various successful breeding horses, their blood still found in some of todays horses. Names like Cserkess = Tscherkesse, Erdelvi = Transylvanian breed, Moldavi = Moldavian breed, Magyar = Hungarian breed and Radautzi = Radautzner breed, giving information about the countries of origin, were given to mares and stallions which were the beginning of beautiful and successful bloodlines with a high level of pure Arab blood. The breed was mainly used in the cavalry because it was a strong but fine breed with a sharp texture and delicate heads. The stud book number was mentioned in the names and Babolna still offers different Moldavian bloodlines rowed 215, 253, 449, 638, 794 and 885, which are also found in our horses and have completely different ancestors. Over the years, Babolna imported Arab mares and stallions found during expeditions to the Far East. 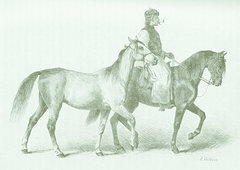 One of the most significant mares was the pure-bred mare 74 Tifle, born in 1810. This mare was used for the Shagya Arab, but also for the pure-bred breeding and can show an outstanding breeding performance. Very successful was a stallion called Shagya, imported in 1836, which was (umrechnen 160 cm in hands) hands high and gave its name to the breed. Also the pure-bred stallions Gazlan (Gazal) and the black horse O’Bajan influenced the breed. Based on the long-established genotype of the mare-lines, the breed was refined by Arab pure-breds and necessarily by a drop of new blood for example by English pure-breds, Gidrans but also Lipizzaners. Through careful selection the breeders focused on optimizing the size, condition, bone substance and the riding attributes of their horses, so they were perfectly suitable for both, the cavalry but also for farming. Shagya Arabs were precious riding horses for the officers during the K&K monarchy. The breed became more and more famous so also other national stud farms obtained genetic material from Babolna and helped the breed to bloom. Especially Radautz, situated in the Carpathian Mountains, Slovakian Topolcianky and the Polish stud farm Janow Podlaski should be mentioned in connection with Shagya Arab breeding. Also in former Yugoslavia a stud farm called Borike was breeding a strong, not too high horse, based on Babolnian and Radautzer bloodlines. In Kabiuk (Bulgaria) and Mangalia (Romania), stud farms are still breeding an old Shagya type. All these stud farms bred shapely horses influenced by Babolna, the focus more and more on general utility horses with Arab blood (today called Shagya Arab). Just one out of four Arabs was a Pure-Bred. For blood replacements, high-quality stallions and mares were imported trough the 19th and 20th century, generating new genetic imprints of oriental beauty, dryness and potential.